With opFlow 3 your organization can rapidly identify congested links, bandwidth hogs, extreme data usage and suspicious behavior in real time; analyzing and interpreting Flow data across a broad range of protocols has never been this intuitive. Opmantek’s opFlow 3 now supports all major Flow standards including, Cisco NetFlow, NetFlow-Lite and NSEL, Juniper J-Flow, sFlow and IPFIX. opFlow 3 comes with a new, easy to use, reporting engine that can produce a range of useful reports on traffic trends and top talkers across your environment or for specific interfaces over time. A Task Driven GUI means faster access to critical information. Select Agents, Interfaces, and Flow direction quickly through a responsive filter panel. Search your TopN summary quickly by Application, Port, Sender or Receiver; drill down quickly to identify high-bandwidth users and squash the network hogs. 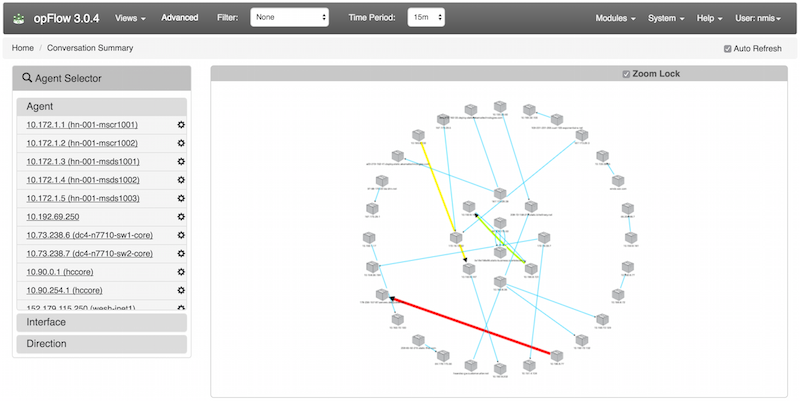 View network conversations interactively using a dynamic Heat Map; visually identify the biggest network traffic generators in your environment. Perfect for NOC environments and executive presentations. The number 1 feature, according to our engineering team, is the new High-Performance Flow Daemon. Supporting a broader range of flow protocols including Cisco NetFlow, NetFlow-Lite and NSEL, Juniper J-Flow, sFlow and IPFIX, opFlow now processes data faster and more efficiently making it even more effective for analyzing extensive multi-vendor networks. Traffic heat maps help to identify the biggest network traffic generators in your environment. To experience these great new features for yourself Download opFlow 3, activate your free 30-day trial license and gain new insight into your network performance today.